Halwa is one of those dishes found from the Balkans to India and claimed as its own by practically every culture and country in between. Although there are disputes as to when, the dish, or at least its name, seems to have moved south and east from Turkey, into Syria and Lebanon, the Gulf States, Afghanistan, and, finally, India. Most agree it was introduced into India by the Moguls in the 16th century. 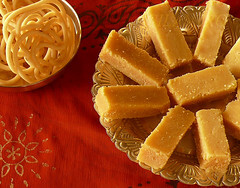 Of all the countries, India possesses by far the most unusual recipes for this most popular, widespread sweet. Some of the most unique and delicious Indian halwas are the ones made for banquets and feasts. One calls for carrot simmered in coconut milk for hours until it becomes a delicate pudding. Another banquet preparation is the pumpkin or gourd halwa and the banana halwa (also found in Turkey). Perhaps the most tasty Indian recipe of all is the " Badam Halwa", made with Almonds, Sugar & Ghee/Clarified butter. The memory of Badam Halwa from G. Pulla Reddy Sweets ~a sweet, moist, nutty halwa prepared to perfection with all traces of its buttery ecstasy still lingers in me. 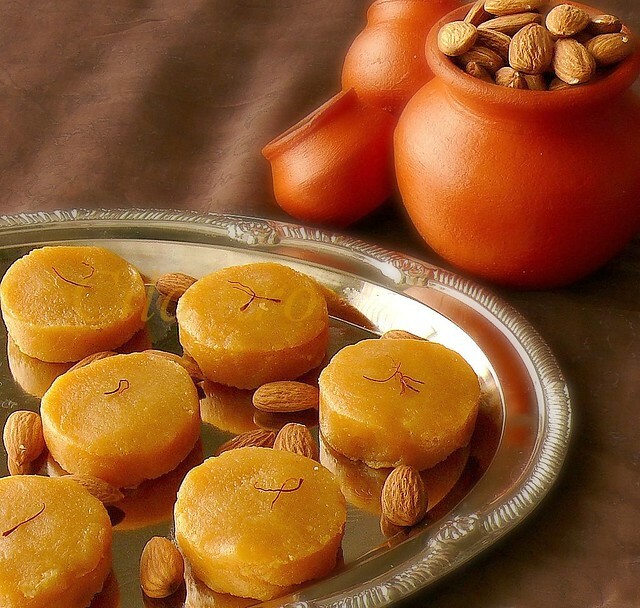 It is a rich desert no doubt but it is impossible to resist the pure magic of this sinful Indian Sweet. Boil 2 cups of water and soak the almonds for half an hour. When cool, peel the skin off the almonds. Just a little squeeze with your your thumb and forefinger will pop them out. Soak the Saffron in a teaspoon of warm milk and set aside. Grind the almonds in a mixer adding very little milk (the less you add the less work for your hands. I have added ¼ cup. You could use lesser than this if your mixer co-operates). 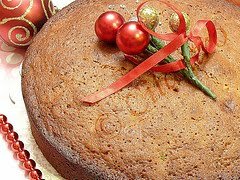 Melt the sugar in a heavy bottomed vessel OR a non stick pan. Let this sugar syrup come to a boil. Simmer for five minutes. Now add the ground almond paste and the soaked saffron along with the milk. Stir well to avoid any lumps. Keep stirring this mixture so that it does not stick to the bottom of the pan. Add a few teaspoons of the ghee at regular intervals. Keep stirring till the mixture gets slightly thick . When it reaches the consistency shown below, remove and let cool. There is no hard and fast rules to it, I prefer it to be little thick. Let the halwa cool. Roll into a small ball and press into desired shapes and serve. TIPS: A pinch of food coloring may be added if preferred. You may also add cardamom powder if you wish. I prefer the taste of the halwa without it, the saffron gives it a nice flavor so cardamom is optional.I have made it to a nice thick consistency, you may take it out a little earlier and serve it in a bowl. The interior defense dines under the sabotage. Hey Dee-Dee :) Happy New Year! They look gorgeous! lovely clicks,my hubby's favorite! oooh! i love this dessert so much... n that is one bitching click.. anybody would be rooted to the ground just by seeing it, not to mention the amount of saliva which drools :)great recipe..
Wat shud I call them??? wow looks yummy cilantro !!!!!!! Those pictures are droolworthy.. Have never made this one at home... your step by step pics are encouraging me! Wowwwwwww, can i have some, drooling here..
Looks delicious and wonderful ! Wow my favorite too looks so tempting...beautiful picture. Beautiful click...U rock as ever....badam halwa is so tempting in color and texture...happy new year to you..
Dont know what else to say! Halwa looks so delicious and pictures are droolworthy!